This is a quick and easy meal that will have you out of the kitchen in no time. Now, I have to warn you ingredients are not exact. I have a bad habit of not writing my recipes down when I cook; this is a recipe that is just tucked away in my old noggin. Feel free to adjust the spices to accommodate your tastes. 1 can enchilada sauce (large can). In a large sauce pan, cook the onions and beef together until crumbly. While cooking these two ingredients add in your garlic powder. Please make sure that the onions are clear (that means they are done). Lightly spray your baking dish with a non stick spray or you can use the non stick aluminum foil (that stuff is wonderful!). Spread about 2-3 tablespoons of the enchilada sauce on the bottom of your baking dish. Place meat and some shredded cheese in the center of your tortilla shells, and roll up. Place them seam side down in the baking dish. 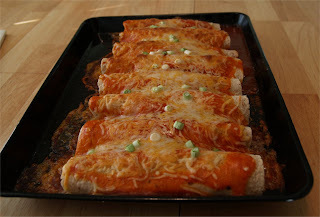 Once all are placed in the baking dish, pour the remainder of the sauce overtop of the assembled enchiladas. Place remaining cheese over the tops of enchiladas and add the scallions. These can be topped with sour cream. ** If you want to save some time, purchase pre-shredded cheese. ** You can use corn tortillas instead of the flour tortillas. **Olives can be added in if you would like.